An estimated 3.5 billion people, or half the world’s population, will tune in to watch this years’ FIFA World Cup, leaving sponsors scrambling to capture fans imaginations. For sportswear giant Adidas the potential return is huge, after spending £62million in order “to make the World Cup in Brazil the best World Cup ever” – for the Adidas brand. Adidas expects to make €1.7billion from the sale of football merchandise this year alone and Adidas’s CEO Herbert Hainer hopes the Cup will catapult the Adidas Group into pole position as leader of the sportswear industry. Through flashy ads, acclaimed and influential spokespeople, and catchy slogans, Adidas is harnessing the world’s passion for the World Cup to grow their brand profile and profits. 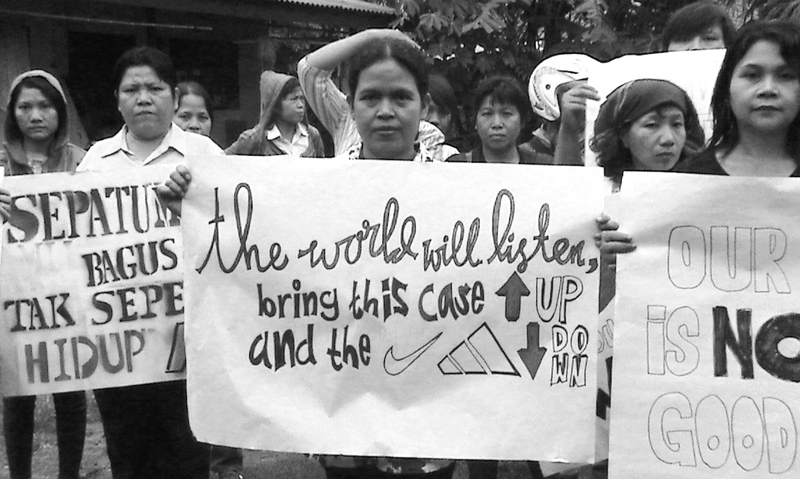 As Adidas is encouraging the world to go all in, for garment workers around the world, they have no choice but to go all in for close to nothing. A majority of the world’s garment workers are young women struggling to survive on their poverty wages. At its core, the garment industry continues to perpetuate a system of extreme inequality, providing inordinate wealth for the privileged few, while condemning the vast majority of workers in the supply chain to unconscionable poverty. It takes a garment worker 18 months to earn what Herbert Hainer makes on his lunch break. This is unacceptable! Join our campaign to ensure that Adidas goes all in for a living wage. Through collective action change is possible.